The multi-million dollar renovation project is now complete. Finally !! The condominium complex is gorgeous. 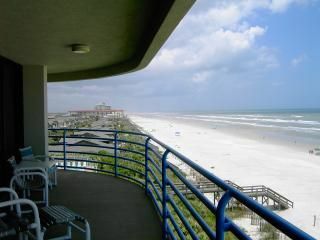 Ebb Tide remains the nicest complex in New Smyrna Beach !! Shower door installation on 11/5/18 will take 2 hours. Fabulous, spacious, high end, chic, ocean front gated condo. Smart TV. Log into your Netflix, Amazon, and Hulu accounts. DVR: record your favorite TV shows and sporting events while soaking up the sun on the beach. Tennis court, exercise center, and sauna. Condo has all new everything. Beautiful new cabinets and counter tops. 2400 square feet including terrace. 3 bedroom 3 bath beautiful condo. 46 inch High Definition Flatscreen Samsung TV Over 300 channels to watch ! Over 120 high definiton TV channels ! Over 40 music channels to enjoy ! Over 40 sport channels ! DVR - High definition digital video recorder. Television in every bedroom. Cable. High speed upgraded wireless internet that is secured. Top of the line new mattress and box springs in the master. Wet bar and wine rack. This condo is in the best stack of condos with superb views of the ocean and beachline. (The beachline in the other 3 bedroom stack is blocked by adjacent condo structures) Guaranteed clean. Also check out our 2 bedroom in Ebb Tide (listing # 13006) and our 4 bedroom Penthouse (listing # 1157) next door at Surf and Racquet. Bring your laptop or tablet. King bed and jacuzzi in master bedroom. King bed in the 2nd bedroom Twin beds and sleeper sofa in 3rd bedroom. On the end of 5th floor with fabulous views and wrap-around-balcony. Washer and dryer inside the condo. 2 large outside industrial poolside Weber grills. No cars on the beach in front of Ebb Tide. Absolutely no pets or service animals. No extras provided: paper towels, napkins, extra roll of toilet paper. Comfortable seating and sleeping. Thank you for your feedback. We currently provide soap and an extra roll in each bathroom. I will relay your comments to our exit team and we will re-evaluate. Our goal is to provide our guests with their best vacation experience ever ! We enjoyed our stay. Condo had all we needed for a relaxing and fun vacation on the beach. Great location and fantastic view. Ebb Tide complex and the management are excellent. Had a wonderful time with family for our 'stay-cation' in New Smyrna. We couldn't have been more pleased with the condo right on the beach, beautiful views and comfortable living space. Unfortunately, it rained for the majority of the 4 nights we were there, but we still enjoyed time together and the condo was super nice. This is our third visit to this property, and we have absolutely no complaints. It is very comfortable and relaxing. It's always very clean. The property manager is great to work with. We'll definitely be back. Potential to be the BEST unit on the beach! This was our second stay in a row in Unit 507. We came back because of the location, the layout & openess in the condo, & the fact that it being a corner unit allows for a gorgeous view and tons of sunlight. The condo association does a great job of taking care of the property & The owner of this condo is such a nice man so I hate writing anything negative, but He could do just a few things and we would gladly pay $200-300 more a week. The unit itself and furnishings are very outdated with obvious shotty repairs and quick fixes. Shower doors & closet doors in front bedroom consistently fall off of the track (same thing last year), kitchen is way undernequipped for anyone wanting to fix meals, throw rugs & area rugs throughout need to be thrown out and/or cleaned, needs all new tile, especially in bathrooms or at least regrouting, all furniture is worn and looks like someone went to an early 1990's yardsale and grabbed what they could, and overall, because of the much needed updates and lack of attention, the condo just felt uncared for & dirty. Our plans for next year are to find an actual house to spend our vacay in since my boys have gotten older and now want to bring friends with them. However, Inwouldnlove toncome back and stay in Unit 507 one day when some TLC has been given to it. You will be 8 minutes away from Flagler Avenue (3.7 miles), the heart of New Smyrna Beach. You will be on the No Drive Beach. Weekly rental is from Saturday to Saturday. Credit cards and Paypal accepted for the security deposit of $500. Balance is due by check 30 days prior to arrival. Returning guest discount: subtract 10 dollars off your rent for each stay with us.